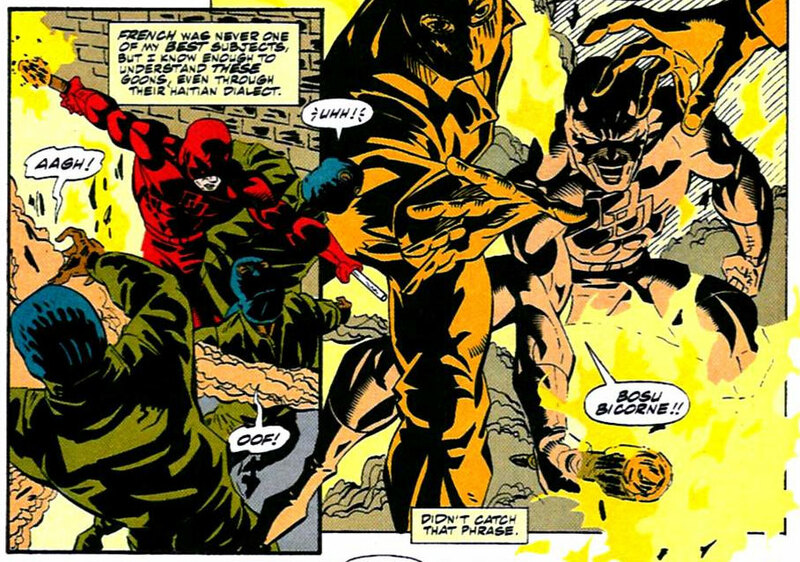 Daredevil: Je parle français? Mais oui! We don’t really know much about what Matt Murdock studied in school except for that he eventually graduated with a law degree. One thing that seems certain though, is that French was likely on his list of electives. While it was hinted in New Avengers #16, by Brian Michael Bendis and Mike Deodato (the issue when Daredevil fights Nazi-robots and joins the team) that Matt speaks German – at least if Jessica Jones is to be trusted – he has been caught speaking French “on panel” several times. See them below! French was never one of my best subjects, but I know enough to understand these goons, even through their Haitian dialect. The Flying Blind arc, written by Scott Lobdell with art by Cully Hamner came right at the end of volume one and spans issues #376-379. I’ve mentioned this story arc in another post so I won’t go into the details except to say that it basically revolves around Matt having his brain rewired by S.H.I.E.L.D. This not only restores his sight(! ), but has him believing that he’s a frenchman by the name of Laurent Levasseur. I think we can assume that some of his language skills (he’s able to pass for French…) are part of the rewiring, but it probably didn’t hurt that he had a foundation to build on. There may be other cases I’ve missed, but I think the above instances pretty much cover it. As a well-versed and well-traveled man, I wouldn’t react too strongly if writers come up with new languages for Matt to have at least some very basic proficiency in, but I can’t remember seeing other languages spoken by him being featured in the comics. If you can think of any, let the rest of us know! As a french reader, that scene in Paris was quite fun. By the way, allow me to translate. “I cannot promess that you will land in the river.”. And for a french person, the formulation is quite odd. In french, the use of “vous” (“you”) is when you try to be polite not when you are threatening sommeone. Especially a lowlife thug. He should have said “tu” instead. I have always preferred it when the writer and/or editor would use the actual language (even with the possibility of an error occurring) instead of using [ ], or other symbols to indicate another language being used. I have very little French, but my wife is quite fluent in both French and Spanish. Help is always near. I like the authenticity of language in comics and have felt that a talented artist is put to the test to make it work for all readers to understand the scene. I think I remember him speaking and/or understanding Japanese in some of the ninja stories over the years. And maybe Spanish at some point … I have a vague memory of him saving bystanders who were shouting in Spanish, and I think he answered them. Although I dimly recall it sounding like the “survival Spanish” I learned growing up in California–enough to order tacos, ask directions, tell people you’re not a cop, etc. Perhaps not too grammatical or polite. I know my favorite phrase as a kid was, “Mas despacio, por favor” … because while I picked up a very good accent very quickly, my comprehension never went beyond basic, and rapid Spanish would go over my head. With Matt’s sharp ears and nimble tongue, I’d expect him to be good with accents, too, which makes me wonder whether it was really his accent or just his pronoun choice that offended that thug. Some Latin would make sense, too, between Catholic school and law school. But I also doubt that he wouldn’t have an accent, even with his sharp ears. Some sounds are just too difficult for a non native to pronounce, in all languages. I am not commenting often or at all, but I want to say I love this blog, I’ve learnt a lot of things reading your articles ! Thank you for that ! However nobody really knows how to pronounce Latin correctly. Just assumptions/guesses.